Jo and I had the opportunity this past weekend to participate in a Korean Homestay. This program introduces you to a traditional Korean village, food, and home. We had a great experience! By the time you’re reading this, you’re probably settled into at least your first full day of 2010. Jo and I have been enjoying the sights of Seoul since the New Year has started and I’ll be posting more about that in the days to come. But as 2009 was ending, we decided to make a trip into Seoul to see something that both of us thought might be interesting… The Kimchi Museum. The facility is located in the basement level of the COEX Mall and is w3,000 to enter. I think that’s a bit pricy, since you can visit most of the palaces in Seoul for that price or less. However, we both like kimchi and thought it might be interesting to see what the folks in charge had put together. The above picture is one of many large displays that show how kimchi is made and stored (during fermentation). The exhibit also chronicles the history of kimchi on the peninsula and has representations of nearly 150 different types of the dish. I found some of the historical pieces quite fascinating (the grinding mills), since they reminded me of tools used by Native Americans around the same time period. 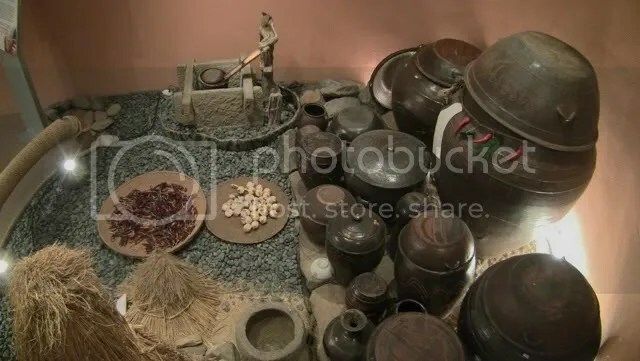 Not only does the museum show the history of kimchi, but it also provides information on its health benefits. The exhibit finishes off with a large educational seminar room with a ton of resources about the types of kimchi Koreans have made over the years, a virtual growing experience, and a tasting room. The latter was my favorite, since kimchi is one of my favorite things about Korea. Jo and I also took the opportunity to test out the new video camera. Thus far, I’ve been quite impressed with the HFS11’s microphone set-up, but I needed to play with it in the field a little more to understand its limitations. Usually on a project like this, I would have used my Zoom H2, but I really wanted to test out the range and sensitivity of the stereo mics. The result was conclusive… for all intents and purposes, the standard mics are good… but under no circumstances should the attenuation mode be used. It really kills the audio levels. In fact, when I post, boosting the levels up to +12db didn’t really do what I needed it to do in terms of audio clarity. A more expansive camera review is forthcoming.